4. Easy to place high on a window or wall or flat on a table for great reception to watch crystal clear HD shows! 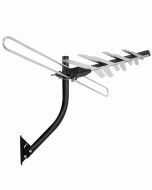 You may also use the 1byone TV antenna stand for tabletop placement. 5. If your location's HD digital over-the-air signal is very weak or you are located very far from a broadcast tower, consider purchasing our 1byone High Gain TV Antenna Amplifier. 1. If you are using a flat screen HDTV, please check your TV's manual to make sure your TV has a built-in tuner for receiving over-the-air broadcasts. 2. 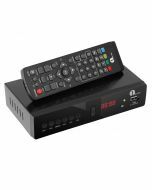 You should retune your TV and digital box from time to time to ensure you are receiving all available services. Retuning takes only a few minutes and can be done with your remote control. 3. Make sure your tuner can receive HD signals, otherwise you won't be able to receive and watch HD channels. 4. Signal quality determines how many channels you can receive as well as picture quality. 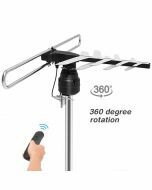 Once you receive the antenna, hook it up to your TV, and try moving it around your home to find the placement with the best signal. You might be surprised how many HD channels you can receive! 5. All of our antennas have a 12 months warranty. If you are not satisfied with the amount of channels you are receiving, please contact us so we may immediately assist you and help to solve any problems you have. 6. Before you buy, find out what channels are available in your area. Visit: http://dtv.gov/maps or http://www.tvfool.com. How any antenna words depends on your exact location. does anyone know how to find out about that? or even, how does it do in mesa az? 1. First go to TVFOOL dot com. And type in your ZIP CODE. You will see a color coded list of possible channels, and the most informative info of any antenna site. 2. From their list for your Zip Code look at the specs called "LOS" [Line of site -- can you see the tower?] and "1-edge" and "2-edge" -- this tells how many mountains are in your distance making these channels more difficult to get their signal. 3. IF you are too close to a Tower, disconnect the 'amplifier' and try again without it. YOU may have to move the Antenna around to 'AIM' it directly at the visible tower [ I have to do the 'aiming' in order to get the 13 available channels I get. 4. An antenna with the largest size [square inches] will pick up better reception from my experience. 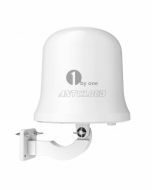 This 1byOne antenna is larger size [sq. inches of surface] and as soon as it arrives tomorrow will test it out on my TV's. My local channels are all "LOS -- Line of site" so I will aim the new antennas at the visible tower [8 miles away]. Even the multi antennas have to be aimed by me and I returned a ANTV AMPLIFIED antenna - reception was worse than non-amplified due to closeness of 8 mile away towers! ** YOU will not receive 30-50-100 channels UNLESS the towers are near you and are not obstructed by mountains/terrain etc. TVFOOL,com list will give you best idea WHAT channels are within your reach/terrain/distance/line of sight. And "NO"... no one is paying me or giving me free antennas I also pay with my own money, just sharing my findings to fellow Amazon shoppers, as many of us do at times. Good luck and happy channel hunting. I can only get 13 total in-range channels from my location, Quite Happy with that. I was excited to get the 50 mile range antenna as a gift however it does not pick up all of the local network affiliate channels. Suggestions? Turn off the amplifier! I just got mine last night, and I live in a major city also. I was shocked when only 5 digital channels were detected by my TV. I moved the antenna around a few times and still had no luck. Finally, when looking on 1byOne's website I saw a tip about how if you're close to the broadcasting station, the amplifier can cause it to "self-oscillate" resulting in a bad signal. I turned off the amplifier and sure enough, the other channels I was missing were detected without moving the antenna. I listened to the other person who answered this question about turning off the amplifier. We were only picking up about 7 channels until we turned off the amplifier and now we get over 30! I don't know the logistics, but if anyone is having trouble getting channels, try that. I will take 30 channels for free for $25. recheck your installation...follow the directions in the package. I had no problems getting all the local channels. 30 miles is about the range that I needed. You should move the antenna around to get the best reception and if you can get near a window...then you should try that. Try moving it to a different part of your house and try putting it on your window! Would this product work in an area with a good amount of trees? I have 6 useable towers within 27 miles on average distance. Based on my experience the antenna I have mounted on a window facing six large full trees and the television signals have not been affected at all. I cannot attest to your unique circumstances, but other antennas that I have experimented with did not perform at all - I lost many stations. I have gone from about 5-10 channels on a good day with other antennas + amplifiers to greater than 50 channels sustained with the 1byone + amplifier antenna (it comes with an amp). I live in the rural outskirts of Fort Worth, Texas. If one window does not work, you might try another window and make sure you buy one with ample cable - I think they come with different lengths...Good luck. Not sure what a "good amount" means.. i have around 6-7 trees around my home and a golf course and i got 50+stations, i did use http://www.antennaweb.org to find out how many stations i may have access to before i purchased. I would give it a try and if you are not happy you can always return it. I highly recommend. probably...we have a small forest on that edge of the farm and picked up signals in that direction. You can always return it, but I think, with those shorter distances, it would work. How do you change channels? once you connect the antenna to your TV, you will go to the menu and have the TV search for channels. Once it has all the channels saved you simply use your remote to change channels. Basically the same way you would normally change the channels. The first responder below has the answer. Go to the MENU on the remote and choose to auto search for the channels. Using the remote for your TV. This is just the antenna that the TV uses to receive broadcast TV channels. You hook the antennae up to the antennae input; then, you change channels with your tv remote. It could be hung in the attic but you will need about a 1" hole to pass the cable thru. What's the difference between the white/blac/silver one and the "window" one? hi. I have a roku tv with the roku controller. I see the antenna in connection on my tv. do I have to buy a different controller to change channels and control the antenna channels? thanks for any help. I have a Samsung TV. There is a TV mode, and you just press up channel or down channel, or enter a number. If your Roku has numbers and an up channel and down channel, it is probably going to work. Will this work in Ghana,west Africa? If you have regular digital broadcasts like here in the US it should. I have anolog tv and I can't get any channels would this work? This only works on an analog TV if you have a digital converter box connected to it first. You will then connect this antenna to the digital converter box that's connected to your analog TV. What kind of tape works best at holding the antenna up? In reviews people state that the tape is weak and used something else but don't say what. I used just the little white plastic Command hooks. My antenna just sits right in them. I will try to submit a picture. I used the sticky pads that came with the antenna and stuck it on my window and it works fine. I have the 35 mile one. abc works fine, but fox (27 miles away) is extremely laggy. would the 50 mile one make a difference or not? Yes the 50 mile antenna works a whole lot better in picking up fox or other stations! I agree with what was mentioned that there are a lot of factors that could make a difference. But I believe the 50 mile one will make a difference as it has an amplifier. I have two of the 50 mile ones even though I live only about 23 miles from the major Washington DC stations. When I turn the amplifier off, I can't receive many of the stations, but can receive all of the major networks and about 40 channels total with the amplifier turned on. I do have to also find just the right spot near a window facing toward DC to put the antenna. But once I've found the perfect spot, the picture has been excellent when the amplifier is on. That depends on where the Fox transmitting antenna is located and the direction that you have your antenna facing. A 50 mile antenna would have more gain-or a stronger signal. will it work in 94595 zip code? If channels are available within its range, with proper placement it should pick up most or all of them. This is a superb antenna. It should work for any zip code, it will just pick up the channels available in that area. Hi Jacob, sorry I can't answer that for you since I am not in that area. However, it does work for me. I receive basic channels which is all I need for right now. Does it work with roku? This is meant to find local channel signals. It should work for any TV that has a cable co axle set up. You need an internet connection to stream on roku. This HDTV antenna works independent of Roku. It plugs directly into your TV and there's no need to intertwine the two devices. Paige, This antenna picks up any High Definition Digital Signal that is being broadcast by local TV Stations. Roku on the other hand, is a different technology. To use Roku you must be the internet, and if you want to stream programs, you need a fairly high speed internet connection. Hope this helps.